Still learning these EM repairs, after learning a lot on my sole EM, Klondike. I find I enjoy these EMs, so I just got this game. Had several issues, which I resolved by adjusting a few of the relays. game is actually in a 4 player game. At least I think that is what it thinks. to player one, the ball count will advance to 2, and the game continues. a four-player game. It seems like the outhole switch should not update the player-up unit, but rather, the ball count unit? be the most likely to look, and why. Love the challenge, and have learned a ton about these...this is stumping me tho. When the game starts, 1 player and ball 1 are lit. Also, player 1 score reel lights up. have done in the posts I am still reading. If you know what stepper advances the '1-4 can play' lights, the 'ball in play' lights and the 'player up' lights, you should be able to manually advance them by pressing their advance solenoid plunger in, and confirm the lights in the backglass respond appropriately. Then manually press the reset solenoid and make sure they spring back home, and relight the first lamp. It is very odd to me that it's going to player 2 with only "1" lit in the 1-4 can play group. Great video Banjo. I watched it several times. My switches are correct, and match the video. I tore apart and cleaned the Player unit in the head. I had read that was one possible cause of this type of weird problem. I cleaned the three Jones connectors in the backbox, since I'd read that could be a problem also. what I am pressing, so I have to think it isn't 180 degrees out. It is really wanting me to be in the fire on this and learn a lot because now it locks on the center solenoid in the chime box at the front, and my Player 1 100 reel isn't firing, so my reset relays in the head are going nuts and score motor is running. I unplugged the Jones connectors in the bottom of the cabinet, to troubleshoot where the short could be, and the chime problem stopped. I plugged them in one at a time, and found that the plug on the right (smallest plug and viewed by standing at the front of the machine), is the one that starts the buzzing. So, I'll have to find out what I've hit, to cause that to lock on. I assume I've got a switch on the playfield that is stuck, locking on the coil. Definitely on the playfield, due to me stopping it with the disconnect of the Jones plug. Frustrating, but I know I'm learning a lot more this way, than a quick, easy fix. start button, it is a four-player game, yet the lights indicate 1 player, and 1st ball in play. One more follow-up for Cody. The game starts out at player 1, ball 1. When the ball drains, it moves the score reels to player two, and scoring occurs there. When the ball drains, it moves the score reels to player three and scoring occurs there. When the ball drains, it moves the score reels to player four, and scoring occurs there. Finally, it moves the score reels to player 1, the ball count updates to ball 2, and it continues. There are switches that open and close to tell the machine how many players are playing and *which to skip* regardless of player unit position and whatnot. 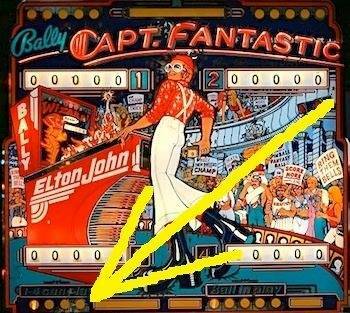 I believe they are on the BACK of the player unit, but maybe not be on these Ballys. Let me look at the schematic for you. I have also seen them on the relay bank. The circuitry for this in EMs is very simple. A game is basically ALWAYS a 4-player game, except, when it has less players playing, it automatically skips over the empty spots. Think of it as it automatically draining the balls for the non-added players because that is basically what is happening. On a lot of games you can actually see it happening too as the lights cycle through on the reels. A player unit ONLY spins one direction besides full reset at the beginning of a brand new game. (which is either in reverse or sometimes they just step themselves all the way around) So to get to player 1 ball 2 from player 1 ball 1, you have to ALWAYS go through 3 other players to continue regardless if they are playing or not. If they are playing, it will stop and let them play, and if they are not, they are stopped on only momentarily and then skipped over by the player unit advancing. Good video. It showed me how it works. You're filling in some blanks I have as a newbie. Once you look at the schematics, I'll look into whatever you want me to. Still getting used to reading those and actively researching that. At this point, I've looked at, gapped, and cleaned, every relay in the cabinet. I've cleaned the Player unit in the head (shiny and lubed), and it functions correctly, using the 1 increment, and reset test of Clay's. I've tightened the screws on the switch-stacks of all the score reels, which forced me to re-gap just about every one. I think me adjusting has affected the Player 1 score reel that won't reset, but I'll look into that tonight. I cleaned the Jones plugs till shiny in the backbox, but not the ones in the cabinet yet. I've watched every switch on the score motor to ensure every make/break and other switches act right, AND cleaned every one. I'm definitely good with getting my hands dirty. I just can't seem to figure out what isn't incrementing the ball, but keeping it on player 1. I also believe the Coin-Unit and the Player-Unit do not communicate well. What happens when You start a FOUR-Player-Game ? Can You play it ? What ... THREE, What ... TWO ? IF (if) You can play a 4,3,2 player-game: Your problems are only "along my red lines". Want to cheat a bit - establishing a permanent Jumper*** "my green line" ? With this You should be able to play a ONE-Player-game - ONLY a one-Player-Game. Jumper*** from wire-grey-red to wire-orange-white. Thank you for the responses! Every one of them gives me a new insight as to how this works. served me up a second ball on playe-one! good. I've gone over hundreds of relays in this game, trying to fix the main problem. between the relay and these reels, since manually activating the individual relay works. The player-up unit problem was tough to find for sure. I feel this should be easier, but I probably just jinxed myself. that should be closed on every number until it hits zero. It should open on "0" and only zero. other and then opens once the reel reaches "0"..
After going through these so many times, I've found that all switches are open at zero. Numbers 1-8, I found that the first two switches, from the top, are closed, but the third, the lowest, is open. Finally, on the lowest, it will close, along with the other two above it, on the number 9. I sometimes like to "sneak-in a fault" into the pin - just for me to learn about the pin and to check my "understanding". See the JPG - want to try (? ): Sneak-in a stripe of paper in-between the switchblades of Number-1-Reset-Relay - the switch for to reset Player-1-Score-Drum-10-to-90. The stripe of paper makes this switch FAULTY always open - the Score-Drum does no longer reset. (((Maybe the pin comes into an endless loop "trying to reset"))). OK - then pull the stripe of paper out - then try to sneak-in a stripe of paper into Switch on the Score-Drum in-between blade-with-wire-orange-black and blade-with-wire-red-black, the stripe of paper makes this switch FAULTY always open - the Score-Drum does no longer reset. (((Maybe the pin comes into an endless loop "trying to reset"))). The schematics are still tough to read, especially in the scoring section. Hard to tell where things are going. the score reel on some of them. I took the 100 drum apart, sanded the points and traces, lubed it, and put it back together. I started a game, and voila' it worked! So I guess it wasn't able to make a good connection. Now the machine is fully working. 100 chime coil and 100 reel locked on when starting a game - switch on playfield got bumped and was touching. Re-adjusted it. Game would not advance ball on single player, but would advance to next player - fingers on player up-were off, due to bakelite being loose. One reel would not reset to zero - took entire assembly apart, sanded traces and switches and lubed. 6) Pop bumper not working. I feel your pain. But in reading your symptoms, I immediately start going through images in my head of relays and switches. My chime for 100 was locked, and it was a switch on the left edge of the playfield. Makes sense, since the chime can't go on, unless the circuit is completed. On the score reels, I tell ya, they have to be set right, or cleaned, or they simply don't work. I'll tell you another situation I just had. I got minty fresh drop-targets All excited I powered the game up, after install, and my drop targets would score as they dropped, but would not reset. My heart sank. But, I turned it off, and using my meter, I made sure each switch was making contact. Amazingly, some were not, but even more crazy, two looked like they totally made contact, yet no matter what, it wouldn't show as a short on the meter. I finally bent the end of the switch out a bit flatter to contact the other switch on a different spot, and voila, both started working, using that technique, and the bank reset! On the score reels, I learned a lot about testing. A great way to see if things are working, is to simply tap the score relay by hand. So in the back, middle area on the left, you will find the 10, 100, and 1000 relays. With the game on, tap them. Your reels should fire. If not, power off, take the relay OUT, and clean and gap both sides of the switches. You can also check on your resets, to see if the score reels are getting the correct connection by using the score relays to get the reels off zero, then pressing the reset relays to see if your score reels start to reset to zero. At zero, they will stop, and the reset relay will do nothing. I noticed that there are two reset relays, that affect 2 score reels each. Left does the 1st and 3rd....right does the 2nd and 4th. I learned on the reels that the switches must open and close correctly. 9 = Closed, Closed, Closed. I had all mine set correctly, and then I decided to tighten the switch stacks. MANY were loose and I was quite pleased with myself for finding these loose, sloppy switch-stacks. My elation faded quickly, as I realized the tightening of the switch-stacks, destroyed most of the switch gaps on the reels! Sooooo...I took out every single reel, painstakingly adjusted every one of them (that needed it), and now I know they are ALL adjusted and tight. I learned that the steppers are sensitive to old grease. They either don't increment correctly, or more likely, when the reset coil fires, it doesn't reset to zero position. Cleaning was fairly easy. I used alcohol and then lubed them, and life was good. I turned it on last night, and my 100 chime is locked on. I turned it off and watched a movie Lol! But, going back to it, I will look for a switch I was a bit too overexuberant in setting, and find the one that is touching, and closing that circuit. I like it to play "hot," so I gap my switches close, especially on the slingshots. My final hurdle, is the chime box. I got a rebuild kit but I screwed it all up, and it sounds like crap. I learned from that, especially that you don't tighten it down really hard, (crushing the brass inside). So, I have a new kit coming, and this time, I will be much more sensitive to how tight I screw them down. It can be VERY frustrating, and the schematics are slowly becoming more clear, but they still are daunting. As my second EM, and probably third EM repair, this machine was amazingly hard for me to fix. But as your immersed in the frustration, and reading, and posting, and measuring, and eye-balling....you realize after it's fixed, how much you learned, because it WAS a hard to fix issue(s). My purchase of Captain Fantastic was brought on my my realization that EMs are not slow and klunky like I thought, and the fact that I learned to repair a couple hard issues on my Klondike, gave me the confidence to buy another. I knew this one had issues, but they turned out to be much tougher than I thought. Thanks for the encouragement. This is my first EM game and only my third restore. When I got it, before striping it down, the first thing I did was put in a step down transformer (240-110v), power up and check all was working. Which it was. So knowing everything was working, I started striping the playfield, cleaned the inserts, bulbs, score reels and back box, re-built the flippers including coils, and replacing coil sleeves. Doing all this, I must have moved things. Still, it is an enjoyable challenge. The video of the Fronter EM was very insightful. I will be referring back to that a lot! I cannot wait to check a few more things out today. BTW how are the chimes numbered, small to large? At the moment when a game is started, the middle and large ones look to be charged as the plungers are tight up against the chine. Sorry, I haven't checked back here in a bit, and it doesn't seem to notify me. I'm no guru...that's why I come here also. But, the chimes should never be stuck up. they should all be sitting on the bottom plate, ready to be momentarily fired. No problem Doug and I meant the Freedom video. Watched it a few times now. As you have a working machine, I was just looking for some information on which chimes fire when which switch is closed and how they release to the score reels. I would ask rotordave to have a look at his machine, who lives near me, but he is in the US at the moment. Ok, I can't upload a picture here. I don't think I've paid enough dues, so I'll try to describe it. Left is 10, middle is 100, and right is 1000, looking in from the coin door. Very top star rollovers are 10 and chime the left metal bar for 10 points. 3 left and 3 right star rollovers are 100 and ring the middle metal bar for 100. Round standup switches at the top are red, and they are 100. Left rollover at the top is 100 or 300 depending on if lit. Roll over this a few times, and you'll hear the 1000 chime as it hits 1000 pts. Middle rollover lane is 100. Right rollover land is again, 100 or 300 depending on if lit. Switch on the right, next to the red standup switch is 10...behind the rubber. Pop-Bumpers are 10 or 100 depending on which is lit. On the left, by the drop targets, two switches behind the rubber are 10 for the top one above the drops and 100 behind them. Left lower rollover is 100. So, you hear the 10 chime and the 100 chime a lot...and once in a while, you'll hear the 1000 as the score reels roll to the next 1000pts. You can hear the 1000 chime a good amount, during bonus count. Thanks Doug. Just what I needed. I have resolved my problem - partially dismantled pop bumpers had a closed switch. Two follow up questions, of you do not mind. 1) is the maximum bonus you can score 15,000? The bonus counter stops at 15 where there is an oversize tooth that stops the bonus score advancing any further. 2) how does the save gate open? What triggers it? I can't seem to get mine to activate by play field switches. Will check on the net as well. Yes, there is a limit on the bonus. I thought it was strange also, but I think that is all the bonus stepper can hold. that has to be activated, in order for that gate to open. In looking at the schematics, I would need guidance on the ball gate myself. It involves a lot of things. the gate relay. Too complicated for my small amount of schematic experience. schematic and shows how certain switches are on, and why. I'll post the link for you also. the manufacturers liked to have some action on the playfield - maybe changing bumpers lightet left-right-left-right- or turning a light on --- then off --- then on etc. See http://www.ipdb.org/showpic.pl?id=438&picno=52054&zoom=1 now and then the middle lane is lighted and invitates You "HERE You can open the gate". Many such features are operated by an "Change Relay" or "Alternate Relay" and in Your pin it is called "Alternator-Relay". It is made pulling and stays pulling for some seconds - then it is made non-pulling and stays non-pulling for some seconds. And the feeding electricity to the Alt.-Relay is done by a switch (sometimes open - sometimes closed) on the "00 to 90 Unit" - often called "Number-Match-Unit" - a Stepper with 10 different stable positions. On the axis there are some teeth actuating the switch --- or wipers on the bakelite handle it: Connection - no connection - connection - no connection etc so the Alt.-Relay is made pull-in / not pulling-in. Skippy2904 - do the bumpers in You pin change "lit / unlit" ? Do You ever get the "invitation light": The ball rolling through HERE opens the Gate" ? Lift the playfield (be cautios: 50 VOLTS AC can kill You) - look at the mechanics on the underside of the playfield - the "Gate" is actually a relay - has a coil and one (maybe 2,3,4) switch(es). A short wire runs from "one side of the COIL to 'Switch mounted on the relay' " --- this is the so-called "Self-Hold-Switch of the relay". Have the pin running (a ball is in play) - take a Screwdriver with INSULATED handle and hold the tip of the Screwdriver at the TWO Switchblades of this Self-Hold-Switch - You make connection - question: Does the Gate-Relay pulls-in and stays pulling ? Means: Does the Gate open and stays open ? In the JPG You see: "1" is closed (accidentally), "2" does close as the ball rolls through the lane, "3" pulls and so closes "4 the Self-Hold-Switch" - the "3" stays pulling. When You use the gate: "5" is opened through its pulling relay - the Score-Motor is made running so "7" also opens - no more Self-Hold-Connection - "3" let go and so "4" also opens - feature has finished. I still have 2 bumpers missing from the playfield. Waiting for parts, so no the bumper lights do not change. The front bumper is always lit. That one is on the playfield. I do not get the invitation light at the top and the "300" on the left and right rollover lanes are always lit. Once the parts arrive, I am assuming these features will then work. One thing, when I close the self hold switch, the diverter gate opens but the relay is very buzzy! Not sure if that is normal. In post #31, I understand numbers 1 through 4. I don't understand 5 through 7 very well. square indicates a closed switch? here http://www.pinrepair.com/em/index.htm then http://www.pinrepair.com/em/index3.htm#buzz --- per definition "what is a relay (?)" the "Gate-Goodie" is an Relay while the thing mounted on the Coin-Door (another noisy thing called Coin-Lockout-Coil) is "only" a coil. The definition of "relay" is: An mechanical thing that has a coil and the coil (getting current) through magnetic force makes (at least) ONE or 2,3,4 ... electrical Switch(es) close or open. And the noisy Coin-Lockout-Coil moves a rod so coins thrown-in at a "not good moment" are reflected towards Coin-Back-department. NO SWITCH on the Coin-Lockout-Coil therefore it is NOT a Relay. The Gate-Goodie does have at least ONE Switch - the Switch to "have Self-Hold-Current, Self-Hold-Circuitry" so it is called Gate-RELAY. here http://www.pinwiki.com/wiki/index.php?title=EM_Repair then http://www.pinwiki.com/wiki/index.php?title=EM_Repair#Bally_Score_Motor and nice http://www.pinwiki.com/wiki/index.php?title=File:BallyScoreMotor3-4View.jpg (from left to right the Cams "SCM-1", 2,3,4,5 ...). Here http://www.pinwiki.com/wiki/index.php?title=File:Bally_Motor_Switch_Levels.JPG on a given cam: The levels - we see (cam 1) SCM-1A, SCM-1B, SCM-1C, SCM-1D. Here http://www.pinwiki.com/wiki/index.php?title=File:Bally_score_motor_timing_1975.jpg there is the "timing chart" - the cams are shown top-down --- from left to the right is shown a FULL revolution. The definiton of on Bally and Williams "a TURN" is "HALF a revolution, turn of 180 degrees". Position "0" is "at home, Motor is not running" - then positions "1", "2", "3", "4", "5", "6", "7" comes one after the other as the Motor makes a turn (((of 180 degrees))) - and the end of a turn is: Reaches again "position 0" and stops. 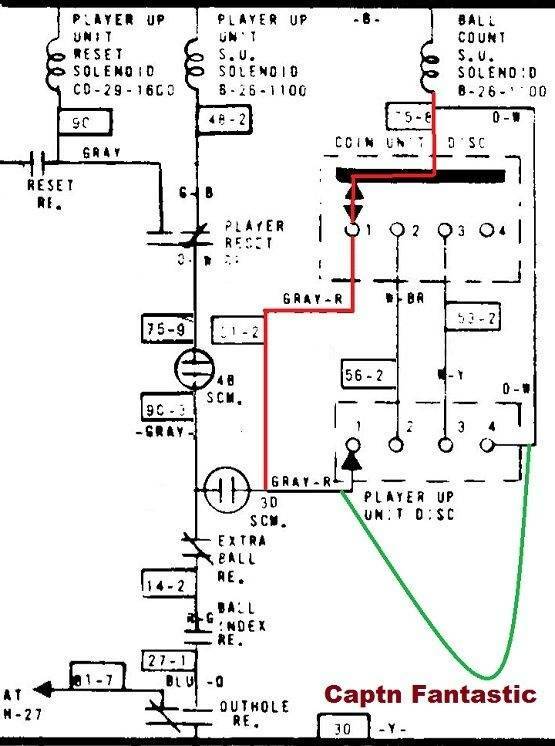 Unfortunately the "timing chart in pinwiki" does NOT match the "picture of the Bally Score-Motor in pinwiki" --- they write: Picture shows the motor of Night Rider - we must look at ipdb-schematics: http://mirror2.ipdb.org/files/1677/Bally_Night_Rider_Schematic.pdf - at ipdb-schematics-A/B-1/2 is the corresponding timing chart - TWELVE cams are shown. Something rather seldom: Look in the schematics at "cam 12" --- see "actuated on left-0,1,2,3,4,5" then NOT actuated on "left-6,7,right-0,1,2,3,4,5" then "actuated on left-6,7". Therefore on Nightrider the "cam 12" is NOT (180 degrees) symmetrical. ALL other cams are (180 degrees) symmetrical. The reason / purpose of the cam-12: It has the function of (other solution would be) "Alternating-Relay, Change-Relay". 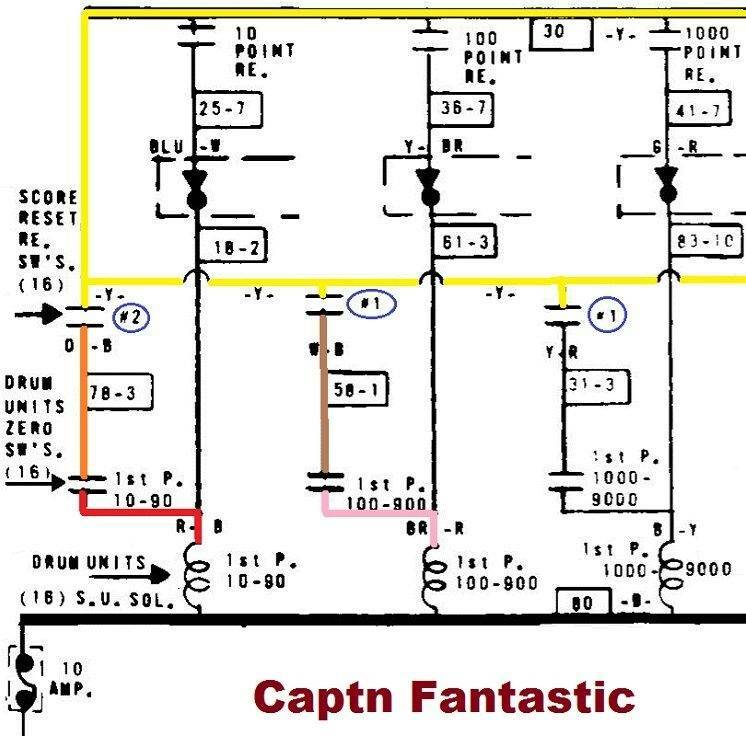 Lets look in the ipdb-schematics of Capt. 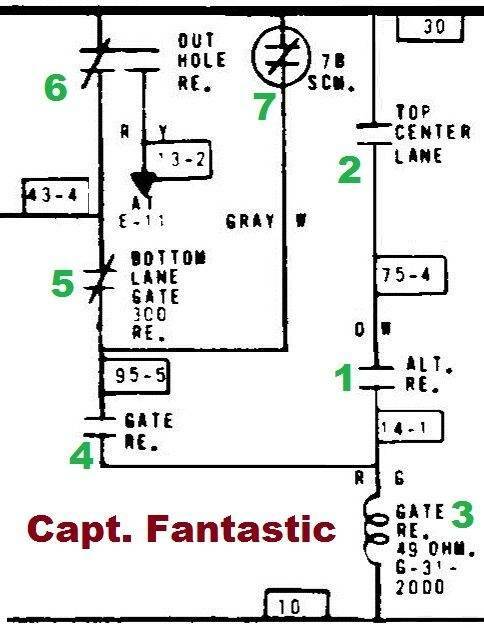 Fantastic at Schematics-A/B-35/36/37. ELEVEN cams - everything is (180 degrees) symmetrical. The "cam 2" does pulse all it switches (SCM-2A, SCM-2B, SCM-2C, SCM-2D, (maybe -E, maybe -F (?)) - "cam 2" pulses FIVE times per turn. "Cam 7" actuates its switchstack ONCE in a turn --- rather to the end of a turn - at positon-5. Lets look again at post-31, JPG --- the "green-1,2" I call "Initial-Current, Initial-Circuitry" so the "green-3" starts pulling --- as it pulls: The switches are moved and the closing "green-4" enables "Self-Hold-Current, Self-Hold-Circuitry". AS SOON as "green-4" closes / is closed: "green-1,2" can open. Let us let roll the ball through the open gate --- You will be rewarded with some points - the "Bottom Lane Gate 300 Relay" is made pulling (it establishes its own Self-Hold-Circuitry) - the "green-5" does open - NOW the "green-3" STILL pulls (Self-Hold-Circuitry through "green-4,7"). But the "Bottom Lane Gate 300 Relay" makes /made the Score-Motor do a turn --- so time comes when the Motor actuates "cam 7" - SCM-7B opens and the Gate-Relay (green-3) looses Self-Hold-Current and quits pulling so "green-4" opens. Bally made this (SCM-7) to have a "delay / time elapses" - Ball rolls through the open gate --- after a short period of time the gaten then closes. P.S. : Do You have faults in the pin ? - Write. I don't have a problem with Captain Fantastic. All issues have been fixed. to get another example from you on how to follow the flow through the schematics. doesn't complete a reset, and kick the ball into the shooter lane. Thank you for taking the time to write a large post. I am going to be going through it and follow your logic. now that I know more about repairing them.